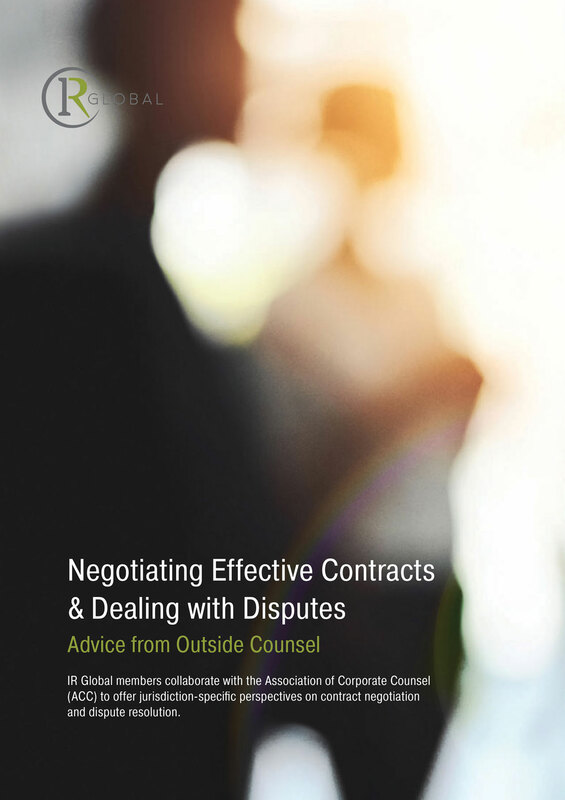 Jian Zhang was featured in a report titled “Negotiating Effective Contracts & Dealing with Disputes: Advice from Outside Counsel“, published by IR Global. This report is collaborated by IR Global members and the Association of Corporate Counsel (ACC). What is your best practice approach when advising General Counsel, to ensure dispute resolution clauses are to their real advantage and do not obstruct enforcement proceedings? First, ensure the agreement is being signed by the real party in interest. Dispute resolution clauses are of little use if the counterparty is a paper company without assets. Piercing the corporate veil is extremely difficult in China, therefore it is critical to ensure that the entity has sufficient assets that can be attached or liquidated after prevailing in a dispute. Do not rely on statements from the counterparty, verify everything independently. For example, if the counterparty is a manufacturer that claims to own their production facility, ask for documents evidencing ownership, verify them against official records, and make sure the same entity is signing the agreement in question. Be very suspicious if a counterparty suggests signing agreements with ‘SPVs’ or offshore entities. Second, venue and governing law selection are key. Remember that any jurisdiction can be used as long as both parties agree. Even though your first impulse may be to use the jurisdiction where your company is located, you should check with your lawyer to explore other options on a case-by-case basis. In some cases, choosing the other party’s jurisdiction may better facilitate seizure of assets in case of a dispute. Are there any particular rules around funding litigation in your jurisdiction that General Counsel should be aware of? Third-party litigation funding is not illegal in China, however, currently there is not a developed ecosystem of third-party lenders. Litigation on a contingency basis is allowed. The government has issued guidance regarding acceptable contingency percentages based on a sliding scale (the higher the amount, the lower the suggested percentage). However, this guidance is not binding therefore clients and firms are free to negotiate their own arrangement. What techniques are typically used by international counterparties in your experience when attempting to gain the initiative during a dispute? How important are civil procedural rules? Petitioning a local court for an injunction to attach the counterparty’s assets is a good way to gain the initiative. Generally, the only requirement for this attachment is placing a bond of 30 percent of the claimed amount. There is generally no adversarial hearing required to evaluate the merits of the case before such an injunction is granted. The injunction order is valid for one year and can be renewed in certain cases. Having their assets frozen for an extended period can be disruptive to the counterparty’s operations, which often brings the counterparty to the negotiation table quickly and with a more cooperative attitude. Finally, given the long backlogs at most courts in China, judges tend to be quite conciliatory and encourage out of court settlements as soon as possible. Understanding civil procedural rules in China is important in order to prepare for and solve a dispute. For example, one can choose to challenge the jurisdiction of the court/tribunal in question in order to have additional time to prepare a defense strategy even if the challenge is without merit in China. Obviously, as in most other jurisdictions, it is important to keep in mind procedural rules regarding statutes of limitations and admissibility of evidence in order to prevent having an action dismissed, or losing the use of important evidence. Know your counter party: Do your own due diligence, and be thorough. Choose your partner carefully and only after a careful examination of their experience and background. Verify everything. Persistence pays off: Relationship building is key to successful negotiations in China. Process is as important as results. Negotiations will take longer than expected, accept it and be patient. Articulate your goals clearly and find ways to achieve them through cooperation. Try soliciting the suggestions from the other side instead of dictating terms. Avoid emotional/confrontational approaches. Avoid traveling to China if there is a dispute: A local court can issue an exit ban without notifying the individual affected. You could be allowed to enter and remain in China, but would not be able to depart. This, of course, could be used as leverage to force you to agree to unreasonable demands. To view or download the full Negotiating Effective Contracts & Dealing with Disputes report here.